Discussion in 'Grappling Technique' started by Jason Pegg, Jun 3, 2014. 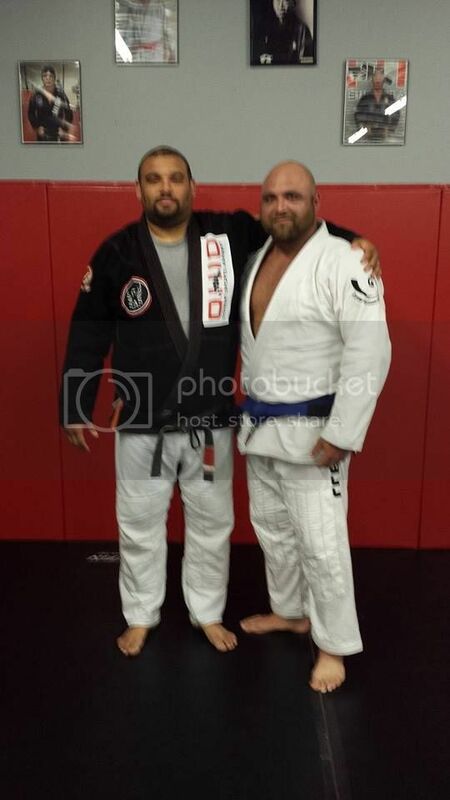 Hey guys, I got promoted to Blue Belt Last week. Ive been training hard, but this was completely unexpected. I started training in January of last year, and missed 5 months due to a non training related injury. I'm pretty stoked about the competition side of it, as there are a TON of gigantic blue belts that are pretty active on the competition circuit around here, but not so much at the white belt level. Sorry this picture is so blurry. We took it after a couple of hours of training and everyone was smoked. Congrats! I should have mine in about 2 weeks. From the limited contact and number of times I've been around Dustin, he seems like a good dude. Many congrats on dat blue. I have to ask, do you feel like you're an actual blue belt? EDIT: I'm not asking this because I don't think you are - if your instructor gave you the belt, then you clearly are - I'm asking because many new blue belts don't feel 'ready' or 'prepared enough' to actually think they're a blue belt. So I was just curious if you had that feeling. Much congrats! I'm about a year away from mine but I'm gonna work very hard for it! Moarrr training! Congrats! I'm proud of you buddy. Congratulations! I can't wait to get my blue belt one day!